115 Commonwealth is located on the north side of Commonwealth, between Clarendon and Dartmouth, with 113 Commonwealth to the east and 117 Commonwealth to the west. 115 Commonwealth was designed by Cummings and Sears, architects, and built in 1876-1877 for dry goods merchant Walter Hastings, Jr., one of a symmetrical pair of houses (113-115 Commonwealth). Walter Hastings is shown as the owner of 113 Commonwealth on the original building permit application, dated October 3, 1876 (the permit application for 115 Commonwealth is not included in the Building Department’s files). Walter Hastings purchased the land for 115 Commonwealth on April 1, 1876, from Dr. Joseph Adrian Booth, a physician in New York City. He had acquired the land from his mother, Mary Ann (Holmes) Booth, the widow of actor Junius Brutus Booth, who had purchased it from the Commonwealth on October 13, 1864. Junius and Mary Ann (Holmes) Booth also were the parents of actor and presidential assassin John Wilkes Booth, actor Edwin Thomas Booth, and actor Junius Brutus Booth, Jr. Edwin Booth, who was a noted Shakespearean actor, leased the Boston Theatre at 539 Washington for a year in January of 1866 and his brother, Junius, subsequently was manager of the theatre from about 1867 until about 1873. Click here for an index to the deeds for 115 Commonwealth. Walter Hastings and his wife, Elizabeth (Glidden) Hastings, lived at 117 Commonwealth. After 113 and 115 Commonwealth were completed, they moved to 115 Commonwealth and sold 113 Commonwealth. Walter Hastings died in October of 1879. Elizabeth Hastings continued to live at 115 Commonwealth in 1880, but then traveled abroad. By the 1880-1881 winter season, 115 Commonwealth was the home of Oliver Ames and his wife Anna (Ray) Ames. Oliver Ames was a partner in his family’s pick and shovel firm, and an officer and director of numerous railroads. He served as Massachusetts Lieutenant Governor in 1882-1885, and as Governor in 1886-1887. 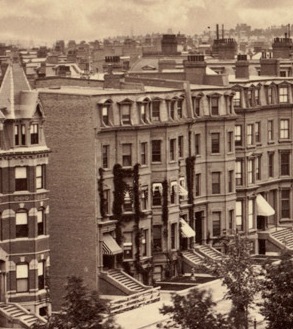 The Ameses leased 115 Commonwealth from the Walter Hastings estate while their home at 355 Commonwealth was being built; they moved there in about 1883 after its completion. In 1883, 115 Commonwealth became the home of Isabella Melissa (Walker) Weld, widow of shipping, railroad, and real estate magnate William Fletcher Weld, and their unmarried son, George Walker Weld. The property was purchased from Walter Hastings’s estate on July 31, 1883, by a trust established under William F. Weld’s will for the benefit of George W. Weld. Before William Weld’s death in December of 1881, they had lived at 1 Arlington and in Newport. Isabella Weld and George W. Weld were joined at 115 Commonwealth by her cousin, Miss Isabella Hazen Dana (she was Isabella (Walker) Weld’s second cousin, once removed; their common ancestor being John Frink of Rutland, Massachusetts). 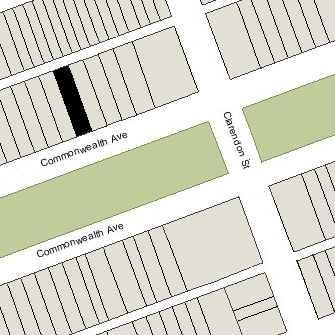 Two of Isabella Weld’s step-daughters lived on the same block: Sarah Minot (Weld) Pratt, the widow of George Langdon Pratt, lived at 127 Commonwealth, and and Anna (Weld) Perkins and her husband, George Hamilton Perkins , lived at 123 Commonwealth. On December 27, 1895, the trust transferred 115 Commonwealth to George W. Weld in his own name. George Walker Weld died in February of 1905 and 115 Commonwealth was inherited by Isabella Weld. She died in October of 1908. Isabella Hazen Dana continued to live at 115 Commonwealth during the 1908-1909 winter season, but moved thereafter to The Abbotsford at 186 Commonwealth. IIn November of1909, 115 Commonwealth was purchased from Isabella Weld’s estate by Ethel (Reed) Morss, the wife of Everett Morss. They previously had lived at 303 Marlborough. They also maintained a home in West Manchester. Everett Morss was president of Simplex Wire and Cable Company, founded by his father, Charles Anthony Morss, which manufactured insulated wires and cables. He also served as Treasurer of MIT. Ethel Morss was a leader of the Woman’s Municipal League of Boston, and meetings of the League (including the 1923 annual meeting) frequently were held at 115 Commonwealth during the 1920s and early 1930s. The Morss’s three children — Constance (Conney) Morss, Everett Morss, and Noel Morss — lived with them. Constance Morss married in October of 1919 to Gardiner Horsford Fiske, a cotton broker. After their marriage, they lived in Weston and later at 206 Beacon. Everett Morss married in September of 1928 to Anne Wentworth. After their marriage, they lived in an apartment at 250 Beacon. He joined his father’s firm and later would succeed him as president. Everett Morss died in December of 1933. Ethel Morss continued to live at 115 Commonwealth with their son, Noel, a lawyer and amateur archeologist. Edith Morss died in November of 1936. Noel Morss married in 1937 to Mrs. Marion (Hayward) Clancey. They lived at 115 Commonwealth until about 1939, when they moved to Needham. 115 Commonwealth was shown as vacant in the 1939 City Directory. In February of 1939, real estate dealer Henry Joseph O’Meara purchased 115 Commonwealth from the Morss family and conveyed it to Miss Katherine Theresa Foley and Dr. Lillian C. O’Donnell, a chiropodist. They operated it as a lodging house. 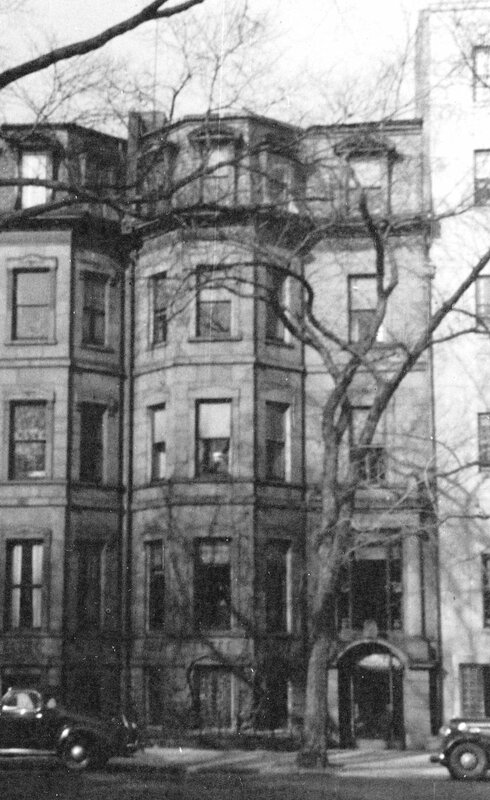 Previously, Katherine Foley had lived in Brookline and Lillian O’Donnell had lived in an apartment at 197 Beacon. They continued to live at 115 Commonwealth in 1941. By 1942, Katherine Foley had moved to 167 Commonwealth and Lillian O’Donnell had moved to Newton Highlands. The Society had moved to 205 Commonwealth by the fall of 1942. In October of 1941, 115 Commonwealth was purchased by Charles Adrian Sawyer, Jr., a construction company executive. He and his wife, Clara Lucille (Zeiss) Sawyer, lived in Waban. By 1942, 115 Commonwealth had become the St. Botolph Club, previously located at 4 Newbury. In June of 1948. the Club acquired the property from C. Adrian Sawyer. It continued to be located there until 1972, when it moved to 199 Commonwealth. In December of 1971, 115 Commonwealth was purchased by attorney Frank S. Ganak and his wife, Yola Nina (DiCecca) Ganak. They previously had lived in an apartment at 111 Commonwealth. They converted 115 Commonwealth into six apartments and moved to one of them. In July of 1972, Frank Ganak purchased 131 Commonwealth. In August of 1983, Frank Ganak transferred 115 Commonwealth to Yola Ganak. They subsequently divorced and she remarried to Nicholas Mourginis. They lived in an apartment at 115 Commonwealth. On December 14, 2004, the building was severely damaged by fire. In May of 2005, Yola Mourginis applied for (and subsequently received) permission to repair the fire damage and remodel the building into four apartments. In September of 2012, 115 Commonwealth was purchased by Robert Atchinson and his wife, Michelle Atchinson. In February of 2015, they applied for (and subsequently received) permission to remodel the interior and reduce the number of units from four to three.